Recent advancements in reaction control and method development strategies have significantly impacted the way in which synthetic chemistry is performed. 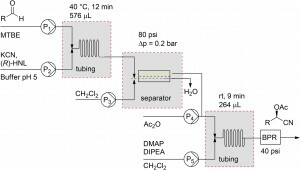 Arguably, one of the most widely amenable and enabling technologies is continuous flow chemistry, which can offer advantages over batch in terms of cost, reaction efficiency and safety. Its implementation is changing the way in which we think about and conduct chemistry and in some areas has expanded our synthetic capabilities. As a result, numerous syntheses of commercially and pharmaceutically relevant compounds are being redesigned around flow processes in order to improve efficiency and reproducibility. In addition, the flow reactor configuration can be readily customized to meet specific reaction demands. A direct example of this comes from Prof. Ian Baxendale’s laboratory at Durham University.2 Heterocyclic motifs are prevalent in pharmaceuticals and have constituted one of the largest areas of research in organic chemistry. Through a convenient telescope continuous flow process, ethyl isocyanoacetate—a highly sensitive and reactive compound frequently used as a key building block in heterocycle synthesis—was generated in situ and used to synthesize diverse heterocyclic structures in a convergent manner. General reaction scheme for the muti-step flow synthesis of 1,2,4-triazole and pyrrole[1,2-c]pyrimidine-based heterocycles. 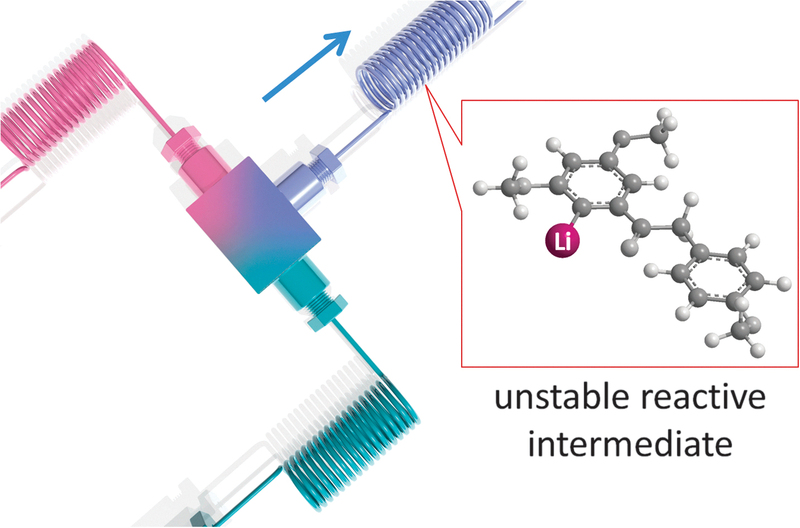 Significant developments within the last decade indicate that the full potential of flow chemistry has yet to be realized. As with any new up-and-coming technology, there exist limitations that more and more researchers are willing to tackle. This is evident in the prevalence of flow systems now being utilized not only within academic laboratories but also in industrial institutions. Interesting and innovative examples of synthetic reactions translated to flow systems have recently been published in Organic and Biomolecular Chemistry and can also be found in the joint OBC/ChemComm collection ‘Recent Advances in Flow Synthesis and Continuous Processing’. Select examples are discussed below. Establishing a multistep continuous flow process is a logical step forward in the development of flow technology. However, genuine applications remain limited due to inherent challenges such as solvent incompatibility, intermediate work-up and dilution effects. Prof. Floris Rutjes and his coworkers at Radboud University have provided a solution to this problem.5 They effectively integrated a two-step chemoenzymatic flow synthesis of incompatible reaction steps through the use of an inline liquid-liquid separation module. Two step synthesis of cyanohydrins and schematic representation of the flow set up with integrated liquid-liquid phase separation module. A monolith reactor testing configuration using immobilized iridium hydrogen transfer catalyst. Finally, Prof. Bradely Pentelute and his group at the Massachusetts Institute of Technology very recently reported an efficient continuous-flow system for the challenging synthesis of peptides containing perfluoroaromatic molecules in place of labile disulfide bonds.7 Application of a rapid flow-based solid-phase peptide synthesis allowed the researchers to circumvent previously encountered problems associated with this chemistry and has resulted in an overall improvement in quality and isolated yield of the peptides.